"The inspiration for this map lies in an ancient legend circulated in Europe since the Middle Ages, a persistent myth identifying the existence of a mysterious and pious Christian king of great wealth whose domain was somewhere in the Indies." Nebenzahl 2004, 52, #2.3. "The legend of Prester John (also Presbyter John) held such sway over the European imagination from the 12th through the 17th centuries that most historians believe it developed around some kernel of fact. The story told of a Christian patriarch and king said to rule over a Christian nation lost amid Muslims and pagans in the Orient. . . . a generous ruler and a virtuous man, presiding over a realm full of riches and strange creatures (centaurs, Amazons, giants), in which the Patriarch of St. Thomas resided. His kingdom contained such marvels as the Fountain of Youth, and it even bordered the Earthly Paradise. Among his treasures was a mirror through which every province could be seen. There were no poor people, no dissensions, no vices in his dominions." Delaney 2012. See generally Ross 1968, Van den Bosch 2007. The myth of Prester John arose at about the time of the failed Second Crusade (1147-49). It was fueled at the outset by a famous and widely-circulated forged letter from the legendary king himself to the Holy Roman Emperor, and sustained over the centuries in large part by the wildly popular (albeit fictional) Travels of Sir John Mandeville. It's not hard to understand why European Christians wanted to believe in Prester John: he was a symbol of the Church's universality; his story confirmed the possibility of miracles; and he stood as a powerful warrior and ally against the threats of Islam and Eastern pagans. At first, Europeans sought Prester John in China and "The Indies," Ross 178-182, but as emissaries and explorers failed over the years to find his kingdom, the belief grew that he was to be found in Ethiopia. Ibid. 182-194; Nebenzahl 52. Thus the legend that earlier drew credence from the known presence of Nestorian Christians in the East was later sustained by the presence of Coptic Christians in North Africa. 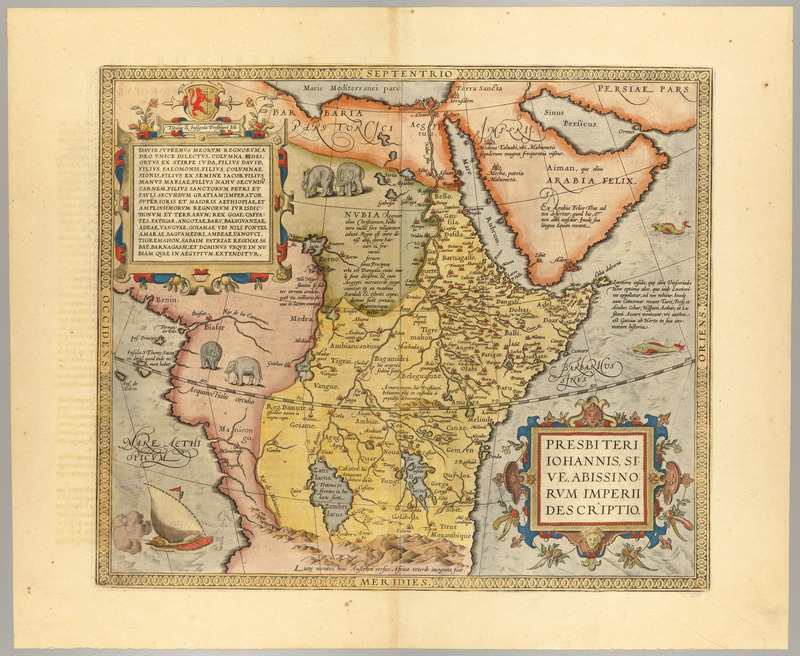 Ortelius's map, first published in 1573, reinforced the myth of Prester John. The lengthy genealogical legend in the upper left traces his descent from King David, and "supports the Ethiopian royal family's assertion that they descended from the Quenn of Sheba, a wayfaring lady whose history includes a legendary union with King Solomon." Ibid. The map shows "the mountains of Amara where the sons of Prester John are held in captivity" (for their security - or that of the king?). The text verso says that Prester John is "without doubt in our age one of the great monarchs of the world." Nebenzahl 52. And Ortelius's map "became a kind of golden standard to depict the empire of Prester John," followed by other cartographers "until late in the 17th century." Van den Bosch 24. In the end, "it was not until the visit of the British traveller Bruce in the eighteenth century that the curtain was fully lifted from Prester John's Ethiopian kingdom." Ross 194. The date is estimated; this map was first added to Ortelius's atlas in 1573 and republished without change over many editions through 1612. Van den Broecke 1996 #175. Ortelius, Abraham. . Theatrum Orbis Terrarum (Perergon). Antwerp: Christopher Plantin.